French statesman and financier; born at Paris Nov. 17, 1800; died at Tarbes Oct. 5, 1867. The son of a wealthy banker, he studied banking, and afterward traveled extensively. In 1847 he was chosen deputy for the town of Tarbes; he sat on the ministerial benches, and occupied himself with matters of finance. After the Revolution of 1848 he retired and wrote three pamphlets which excited considerable comment—"Observations sur la Question Financière, Adressées à l'Assemblée Nationale," "Pas d'Assignats," and "Opinion de M. A. Fould sur les Assignats." His violent attacks upon the Garnier-Pagès administration brought him into prominence, and on July 8, 1849, he was elected to represent the people of Paris in the legislative assembly. On Oct. 31 of the same year he was appointed minister of finance by the prince-president Louis Napoleon, whom he is said to have aided financially. As minister he promoted several important measures, including the abolition of the income tax and of the taxes on rents and on advances on mortgages; he also established the Algerian Bank, and provided for the pensioning of the aged. During the ministerial crises of 1851 he wastwice dismissed and recalled, but after the coup d'état (Dec. 2, 1851) he retained his portfolio until 1852, after which he became a senator and then minister of state. His resignation was due to the decree of the emperor regarding the property of the Orleans family. 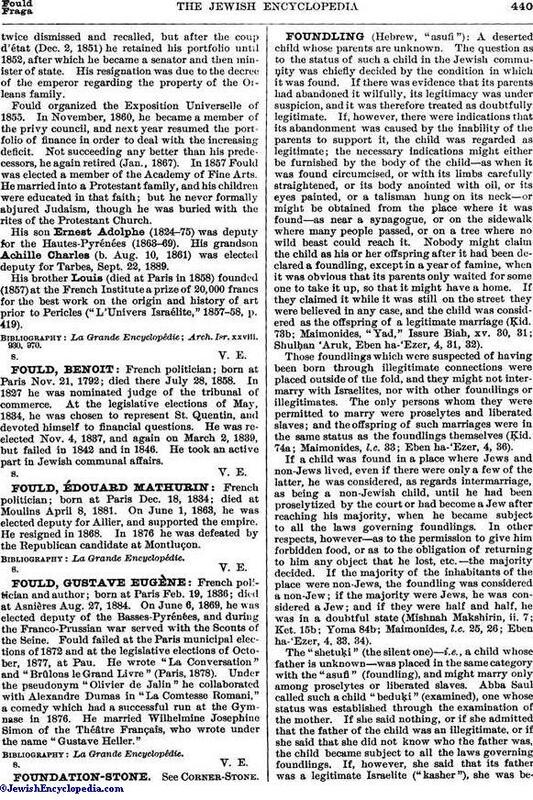 Fould organized the Exposition Universelle of 1855. In November, 1860, he became a member of the privy council, and next year resumed the portfolio of finance in order to deal with the increasing deficit. Not succeeding any better than his predecessors, he again retired (Jan., 1867). In 1857 Fould was elected a member of the Academy of Fine Arts. He married into a Protestant family, and his children were educated in that faith; but he never formally abjured Judaism, though he was buried with the rites of the Protestant Church. His son Ernest Adolphe (1824-75) was deputy for the Hautes-Pyrénées (1863-69). His grandson Achille Charles (b. Aug. 10, 1861) was elected deputy for Tarbes, Sept. 22, 1889. 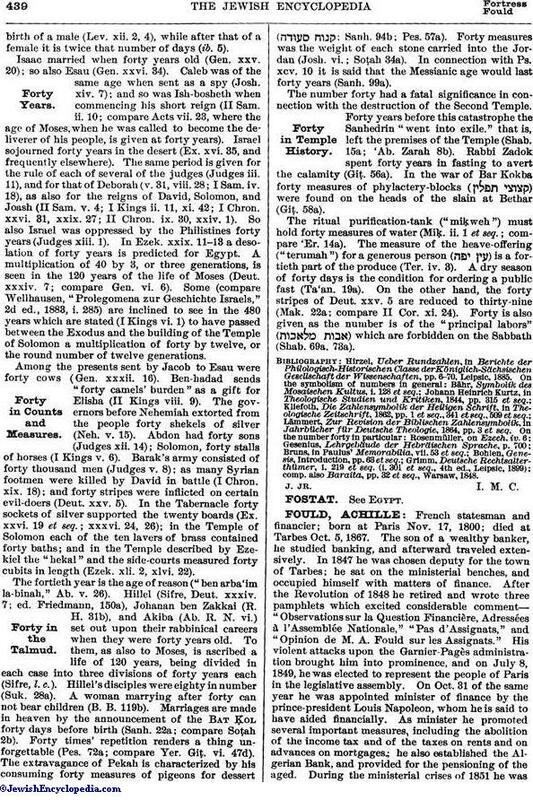 His brother Louis (died at Paris in 1858) founded (1857) at the French Institute a prize of 20,000 francs for the best work on the origin and history of art prior to Pericles ("L'Univers Israélite," 1857-58, p. 419). Arch. Isr. xxviii. 930, 970.